Two Long Branch residents whose homes are targeted for condemnation under the policy of eminent domain are heading to court this morning to try to convince a judge to block the taking of their oceanside houses for condominium development. The Matzel and Mumford Organization of Hazlet is teaming up with Applied Development Company of Hoboken to build the condo project which has resulted in the displacement of area residents, many of whom are senior citizens. "Matzel and Mumford's considerable consumer awareness in this area and it's stellar record of customer satisfaction made it a logical choice for this partnership," notes David Barry, Applied's President. 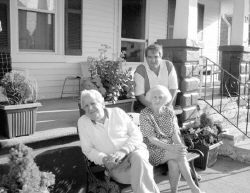 Ocean Terrace residents Louis Anzalone, age 89, and Frances DeLuca have asked Monmouth County Assignment Judge Lawrence M. Lawson to invalidate the condemnation of their homes by the city because, they claim, the city has not shown that the properties are in need of redevelopment and therefore eminent domain cannot be used. The city is in the midst of a massive redevelopment of its oceanfront that includes new high-end shops, townhouses, condominiums and apartments where single-family homes used to stand. Lawson is scheduled to hear arguments at 10 a.m. in Freehold. Opponents of eminent domain - the taking of private property for public use - are expected to protest outside the courthouse an hour before the hearing.